Celebrate special occasions with a world class experience using this 7-piece Japanese hot sake set. Each piece in features a hand-painted blue floral design on a glossy white ceramic exterior, a beautiful combination that brings the perfect touch of elegance to any table. The tall pitcher makes it easy for you fill each of the 4 small glasses with sake, shochu, soju, or baijiu. This set also includes a beverage warmer to keep your drinks hot; simply light a small tealight candle (not included) inside the sake warmer, set the warming cup on top, then place the sake carafe inside to create a soothing beverage that will warm you up in no time. Feature this beautiful sake set at your next event to entertain guests or arrange it on any table or counter top to add exquisite style to any room. Approximate Dimensions (in inches): Carafe - 5 H X 1.5 Diameter; Shot Glasses (each) - 1.75 H X 2 Diameter; Warming Mug - 3.5 H X 4 Diameter; Candle Holder - 2.5 H X 4 Diameter. A decorative traditional hot sake serving set made of ceramic, featuring an elegant blue and white floral design. 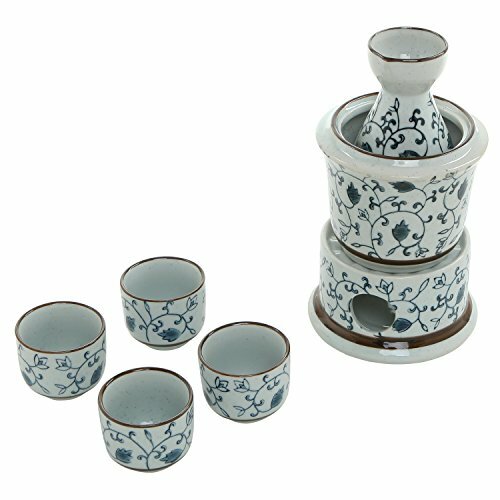 Set includes 4 small sake cups, 1 serving carafe, 1 warming container, and 1 tea light holder. Perfect for warming up on a cold afternoon or entertaining your dinner guests on special occasions.